A range of gorgeous Father’s Day gifts from little ones and big ones. Whether your Dad is a music fan or a big softie you can be assured of finding something for them on our curated Father’s Day pages. If it’s wall decor you’re after for Father’s Day you’ve come to the right place. Our prints are unique and heartfelt and are printed using lightfast inks onto heavy art paper to create a keepsake gift that will last for many years. And if it’s funny cards or personalised cards you’re after we’ve got that covered too! 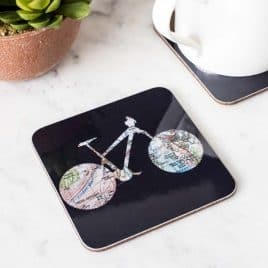 A rather cool and practical cycling gift for him. Our design-led tea towel makes the ideal gift for a cyclist. 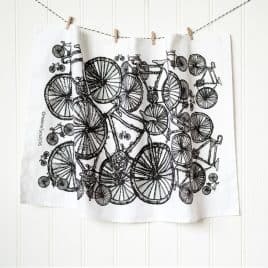 Featuring Helena's mono-printed bikes in glorious repeat on a generous 100% cotton tea towel. Presented with brown craft paper band ready to give as a gift. 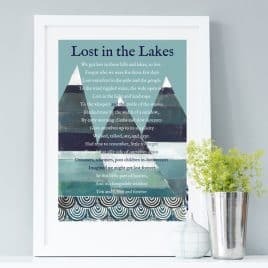 This wonderful Lake District Print has been created as a collaboration with Steven on words and Helena illustrating. It perfectly captures what it is about the Lake District that people love and return year in year out for. It makes the perfect Christmas gift for a friend, husband or wife and will spark many a happy memories of time spent walking and drinking in the fresh air. 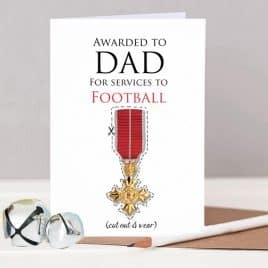 A brilliant personalised Father's Day card complete with OBE to cut out and wear! 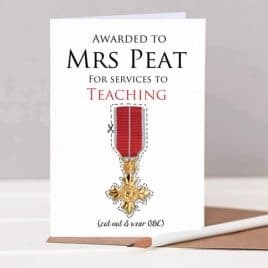 A brilliant personalised teacher thank you card complete with OBE to cut out and wear! 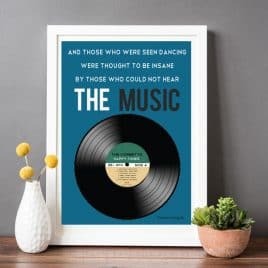 This fantastic personalised vinyl music print makes the perfect Father's Day gift for Dad. Personalise it with your family name, date and your favourite 6 tracks. 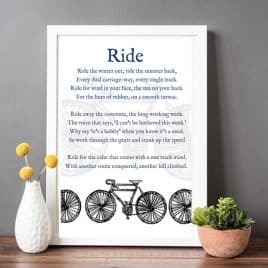 Cycling Print - gift for a cyclist This fantastic poem has been written by our very own Mr C - himself a cycler. I think you'll agree that it captures the thrill of the hill perfectly (see what I did there? That's why I stick to the pictures!) Ride the winter out, ride the summer back, Every dual carriage-way, every single track. Ride for wind in your face, the sun on your back. For the hum of rubber, on a smooth tarmac. Ride away the commute, the long working week. The voice that says, ‘I can’t be bothered this week.’ Why say ‘it’s a hobby’ when you know it’s a need. So work through the gears and crank up the speed. Ride for the calm that comes with a one track mind. With another route conquered, another hill climbed. 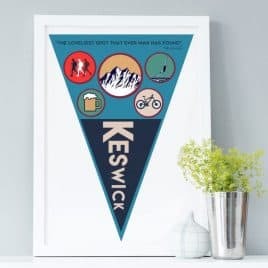 We've done a twist on the old pennant flag here illustrated with all the activities you can get up to in Keswick. In a gorgeous, slightly vintage colour palette this print makes a super Father's Day or Birthday Gift. 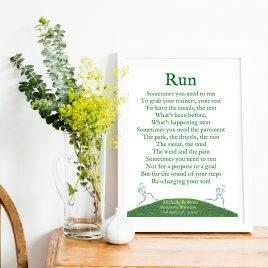 Personalised Women's Running Print to motivate and inspire your favourite runner. Personalise with name, race, date and race time in a choice of colours to mark a special race fixture or occasion. You can even choose the t-shirt colour which is brilliant if the runner is a member of a running club. If not just choose theirs or your favourite colour! 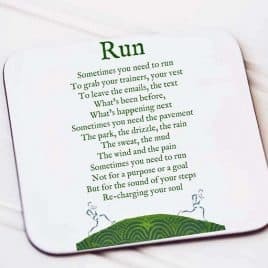 "Run"Motivational Print gift for marathon runners. Show your respect with our special print written by a runner for runners. "Sometimes you need to run To grab your trainers, your vest To leave the emails, the text What’s been before, What’s happening next Sometimes you need the pavement The park, the drizzle, the rain The sweat, the mud The wind and the pain Sometimes you need to run Not for a purpose or a goal But for the sound of your steps Re-charging your soul" The verse on this inspirational print has been penned by a runner for runners. It perfectly conveys the joy and benefits of taking yourself off for a trot be it hill running or chat and jog with chums. Taken from an original by Helena which was created using lino print, mono print and collage, this print is brand new for 2017 and as such features a fresh, green palette. If framing is selected your print will be mounted in an off white conservation mount framed in a white, black or oak frame as shown in the photos. A4 prints are mounted and framed in A3 frames (29.7cm x42cm) We use lightweight framing materials and perspex glazing which has exactly the same appearance as glass. It has the additional benefits of safer transit and fewer breakages. Your framed prints will be carefully packaged and boxed up to arrive in pristine condition. This thoughtful wedding or birthday gift will not be bought twice! You know it will be unique and treasured. And it's easy... Just send us a photo by emailing it to helenatycedesigns@gmail.com, add any specific details to the drop down boxes on the right and we'll do the rest.If a cycler is required you can add a number or a name to the cycle jersey, choose the colours - the options are endless really - you create it! We start with a little sketch then progress to hand painting the wooden bottle opener. This isn't a fast process so please allow up to 14 days. If you need your bottle opener sooner just let us know and we'll see what we can do. Once it's painted (using hard wearing and non toxic acrylics) we'll give it lots of blasts of strong acrylic varnish so that it lasts and lasts. And you needn't stop at cyclists. We can paint almost anything onto these gorgeous bottle openers so whether it's a rugby player, football fanatic or trapese artist just send us the photo and we will do the rest. These bottle openers also make perfect wedding gifts and can be bought as his and hers (please see our seperate listing or contact us directly). 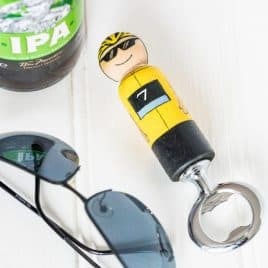 These unusual bottle openers also make excellent corporate gifts - please contact us at helenatyceedsigns.com or on 07984185344 to discuss your requirements. All bottle openers are sgned by the artist (Helena Tyce) and presented in a beautiful brown craft gift box which is ribbon wrapped and ready to give. 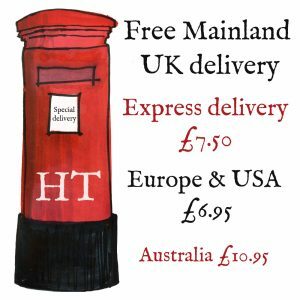 We can even send direct to the recipient with a gift note - just let us know in your email who you'd like it sending to and what the message is. It really is that easy. 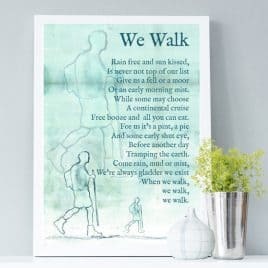 Walking Wall Art - another belter of a poem courtesy of Steven Corbett - this time an ode to the joys of walking and hiking. Complimented by Helena's illustration - hand painted and mono-printed to create a stunning print perfect for walkers. 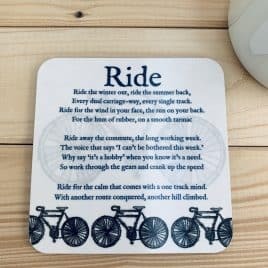 "Ride" Cycle Poem Coaster - gift for a cyclist - bike gift - a gorgeous gift for the cyclist. 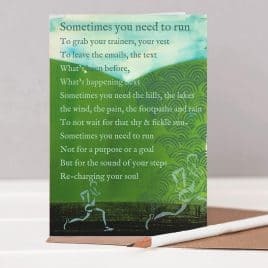 Written by a runnner for runners this excellent poem is now available as a motivational card. Here come the bears! 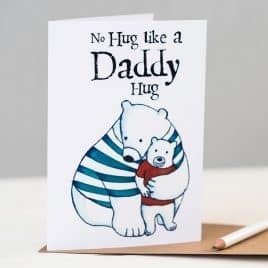 Our Daddy Hugs Father's Day Card is taken from an original painting by Helena Tyce this gorgeous card shows little bear wrapped in Daddy’s arms – warm, safe and happy. Perfect for Father’s day or for birthdays and suitable for Dads and Grandads alike. Choose from 1, 2 or 3 little elephants (the children) and choose from 3 sizes. Choose the colour of the coats of the big elephants. You can even choose to have flags on our elephant print to represent dual heritage. If this is chosen just add the flags you'd like in the box below the options. Add the name of the family. The colours of then hearts will be chosen to co-ordinate with your chosen jackets. 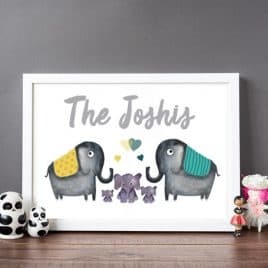 Your personalised elephants print will be created digitally especially for you with your chosen details. If you're unsure of anything just drop us a line at tycesales@gmail.com. Once the artwork has been created your print will be professionally printed on to gorgeous heavy art paper using light fast, pigment inks which will let a life time. The paper we use really absorbs the ink to give wonderful, vibrant colours. This print is offered unframed (£24) and is presented on a backing board and cello wrapped. You can also have your print mounted and framed in a white frame (£72). Please choose from the drop down box and allow and extra 6-8 days for framed prints. Please note - we cannot send framed prints internationally. All prints fit a standard off the shelf frame so if you choose to frame it yourself it's easy. We know Father's Day can feel a bit overly commercial. And we know really its about the lie in and the breakfast in bed! 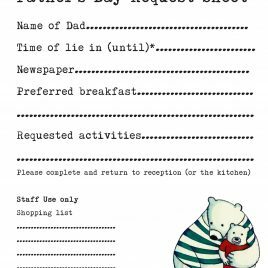 So I've designed a little sheet to help your kids plan a lovely Father's Day for Dad. Get them to quiz Dad (covertly or not so!) and find out what will make his day. Just right click on the image to save, print off and you're away! Best of all it's completely free. 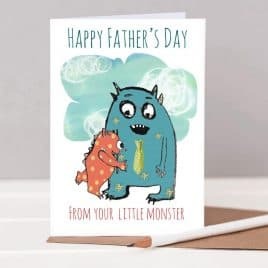 Featuring our cheeky wee monster this lovely Father's Day card is bound to put a smile on Daddy Monster's face! 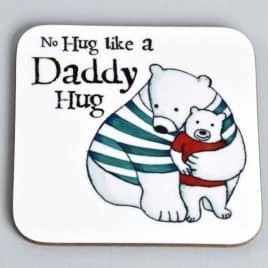 Perfect for Daddy Monsters everywhere! The original "Mini Masterpiece" card and still the best! If you're anything like us here at Helena Tyce Designs HQ you give two cards at birthdays and Christmas - one shop bought, one lovingly hand-crafted by your tot. 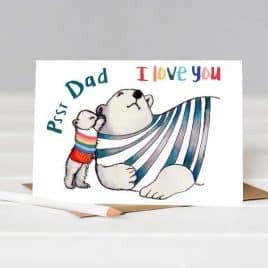 So we've rolled the two into one - a gorgeous pre-printed Daddy card which can be personalised by your child. 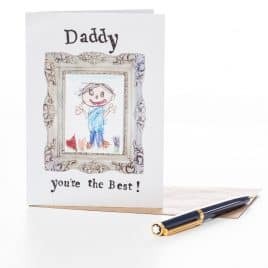 The card features a blank frame for your child to draw their own, special Daddy portrait in and is blank inside for a special message be it Birthday or otherwise. A striking contemporary bike print perfect for Father's Day or birthdays. Do men like cycling? Yes they do! And the freedom that comes with 2 wheels is one of the biggest draws of the nations favourite pastimes. This has been the inspiration for our latest art print. It started life as a mixed media art work - collaged, printed, painted and drawn with a careful eye on fresh, current colour and edgy composition. Hand drawn contemporary typeface combined with the imagery and our very own cycling phrase makes it a modern classic. 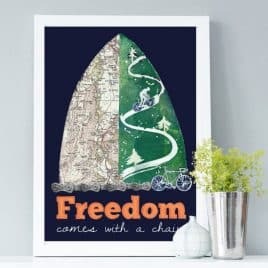 This fresh print has a colour palette that would compliment all interiors and comes with a choice of framing options (see the drop down box below). A super cute Father's Day for the dog lover with a cheeky film reference! 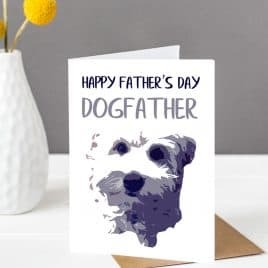 Featuring our cheeky cockapoo our Father's Day card is a must for Dads who love their dogs. Our adorable "Psst Daddy" card is perfect for Father's Day and for birthdays.